When it comes to relationships I’m the ultimate Armchair Quarterback. I know exactly what to do in theory, it’s the getting out on the field and executing the plays that seems to allude me. More than once I’ve been told that my problem is I build up impossible expectations in my head, or “write the story” for how something will go, and in the end I basically set up guys for failure. I’ve also been told that I expect black and white from everyone else while I tend to live in the gray. Ouch. Mostly because both observations are pretty accurate. So, part of this year of trying new things has me focused on recognizing that behavior in the hopes of changing it. Not the easiest of tasks. Especially considering one of my twelve items to try this year was to plan a date and take someone on it. However, in my mind that automatically reads as planning a date worthy of old Hollywood. One of those grand gesture-type of dates that’s clever, thoughtful and memorable. In short, the perfect date. Right there I’d already undermined myself without even realizing it. Perfection is one of those gray area terms ripe with unrealistic expectations. Original Crush’s birthday is December 1st, so about a month ago I had decided to plan the perfect date to celebrate his birthday. On the surface this is a very thoughtful plan; however, truth be told, it was also rather selfish. Deep down I think we often plan for others the things we’d like done for us. For my birthday OC sent me a text in the morning wishing me a “happy 35th anniversary.” That was it. No lunch date, no drink after work, no gift, no card… heck, he didn’t even sign the office card that was passed around for me (until I literally brought it to him after the fact and made him sign it — classic Awkward Jean move). So, like I said, if the truth be told some of my “perfect date” planning was probably more selfish than I’d like to admit. So, with the help of my hockey-loving friend Erica, I bought tickets to a hockey game for the Friday after his birthday. Since it wasn’t a professional hockey league I thought I could make up for that with great seats — that’s where Erica came in, I wasn’t really sure where the “good seats” were. I ended up getting seats just off center court (rink?) in the first row (on the glass??) behind the home team. More than just planning a great date, I also wanted to plan a great birthday because on his actual birthday OC was driving home from Thanksgiving in Indiana at his parent’s house. Not a great way to spend a birthday, so I made sure my house was not only decorated for Christmas, which is always so pretty (read: romantic) with all the white lights, but also for his birthday. I hung a sparkly ‘HAPPY BIRTHDAY’ banner and got him an ‘It’s My Birthday’ sash and a party hat — blue, his favorite color to match the blue cupcakes I made him. I figured we’d stop by my house on the way to the hockey game, drop off a car, surprise him with his cupcakes and birthday paraphernalia and then be on our way to the hockey game. It was the perfect plan. All I told him was that we were celebrating his birthday on Friday, December 6th and to put it on his calendar — the rest would be a surprise. As you can imagine, I’d already fallen victim to one of my classic relationship landmines — the Hollywood version in my head. I had the whole night planned to every detail, but none that I shared. Just expectations I created in my own mind — good luck to him on figuring them out. Basically, I set him up for failure. So the week of the Perfect Date arrived, and with it an awful winter’s cold. I’m talking man down, congestion, coughing, grogginess, grumpiness — you name it, I had it going on. All week I desperately fought the cold. I slept, I tried every remedy anyone on Facebook would share with me (literally — tried them all). I bought any over-the-counter medication that claimed to help. I practically took out stock on all things Vick’s. Friday rolled around and I suffered through work — even though my boss told me I looked miserable and should go home. (Sidebar: As a child if we stayed home from school sick, we couldn’t do anything that night… as an adult I guess I’ve held on to this policy. No work — no play. So I stayed.) Finally around 3:15 I threw in the towel. I needed just ONE more cleansing of the sinuses with my Neti pot if I was going to make it through the night. Our plan had been to leave work together and drop a car at my house (where the birthday surprises were), but there was no way I was going to drain sinuses in front of OC — even I’m not THAT awkward. SO, I told him to meet me at my house. At 6pm he called to say he was leaving. Then told me he was kidding and was close, he’d call when he got here. At about 6:15 he called to say he was out front. So, I told him he could drive and I’d just meet him out there in a second. I put the cupcakes away, blew out the candles, looked at my sparkly decorations, turned out the light and headed out the door. Angry Jean. These are the things we do. We build up expectations in our heads, we don’t communicate our needs, and then we hold others accountable for the impossible standards we’ve set that they’ve let us down on without ever knowing it. I am not alone in this. We all do it. Some of us recognize the behavior better, some of us head it off at the pass before it becomes destructive and some us throw gasoline onto its flames until it burns out of control. Traditionally I’m a perpetrator of the latter, but am really trying to work on the first in order to do the second. OC: Are you mad that I’m late? OC: Do you not feel well and need to stay home? And I did. I finally listened that Armchair Quarterback in my head who knew all the right moves, all the right plays, just had never really been out on the field. I let go of all the expectations. I sucked it up that I didn’t feel well. And I had a great time. The game was very exciting and fun. OC was charming and witty and sweet. When I stopped writing the script in my head and just went with the flow, I was amazed how little disappointment I felt and how much I just enjoyed my time with him. After the game we went out and grabbed some dinner. Then he took me back and dropped me off at my house. He never saw my pretty, romantic white Christmas lights or the sparkly birthday banner. 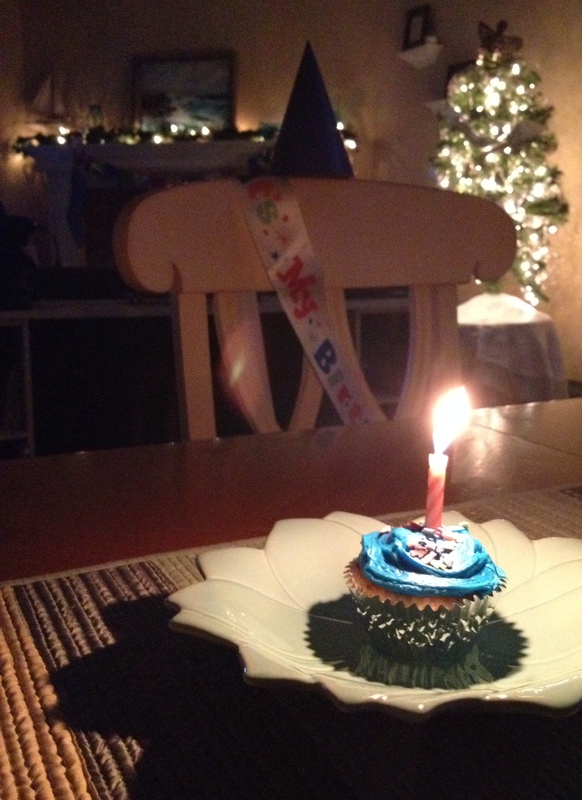 He never got to make a wish on his birthday candle and enjoy his blue cupcakes. He never knew I bought a brand new bra in his favorite cobalt blue color (just in case). He just dropped me off and thanked me for the evening, told me to get some rest and feel better and to let him know when we could go out again. In short, pretty much nothing I had planned actually happened… And yet, it was a perfect date. Sometimes I think we’re our own worst enemies. Our ideas of perfection and our great expectations… they just undermine the potential that reality holds. At least for me. So, time to not plan the next date. I’m making him watch Love Actually — he’s never seen it. I know, practically sacrilegious! Don’t fret my friends, we’ll fix that… with no hope or agenda*…well, maybe a little hope. *Quote from Love Actually by the character Mark. This entry was posted in Uncategorized and tagged Awkward Jean, Original Crush, Perfect Date by AwkwardJean. Bookmark the permalink.